Ellen Smith, BS, RN, PACE of the Triad Center Manager, had seen the problem before. As former supervisor for a hospice and palliative care agency, her patients needing dental care had to be shuttled from home to a local dentist and back home again. What made matters worse, the caring dental staff was afraid to treat some of her fragile patients, wanting to refer them to a specialist in the area. 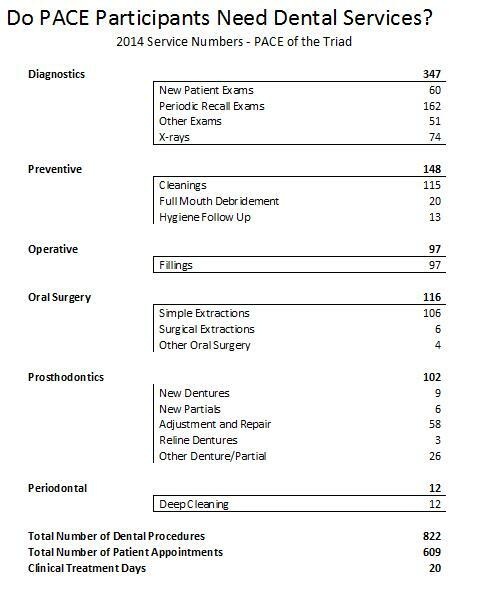 It was a wasted trip, a terrible use of resources and resulted in a patient still needing basic dental services. Oral health, neglected during the illness process, was becoming an irritating source of pain and infection. 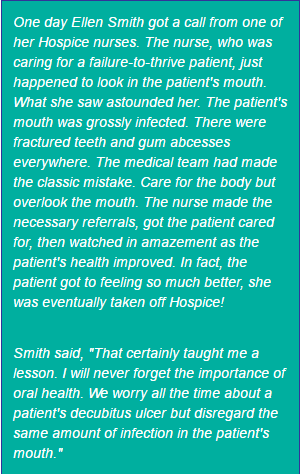 Ms. Smith had heard about Access Dental Care (ADC) through her nursing home contacts. She knew this non-profit special care dental organization provided onsite care to skilled nursing facilities, group home day centers and HIV/AIDS patients in the surrounding area. Could this be the answer for PACE of the Triad, a Program of All-inclusive Care for the Elderly responsible for providing comprehensive health care services? How did the contract work? ADC had always charged nursing facilities a retainer fee plus billed Medicaid and private pay patients on a fee-for-service basis. The retainer fee allowed the organization to break even, compensating it for daily transportation to facilities, billing and communication with responsible parties and the emergency on-call service. Ms. Smith stated that “we started out with the same approach, but because we were paying for the individual services, our team had to review and approve every treatment plan. Want to know more about Access Dental Care? 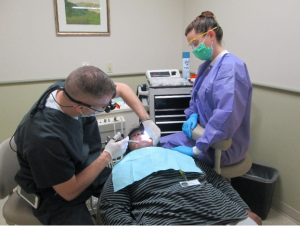 Visit their website, www.accessdentalcare.org or call their Asheboro office at 336-626-7232. For information about PACE of the Triad, visit www.pacetriad.org or contact 336-550-4046.